Workstation lite. HP expands its mobile workstation range with a 14-inch alternative and rounds off its product portfolio. 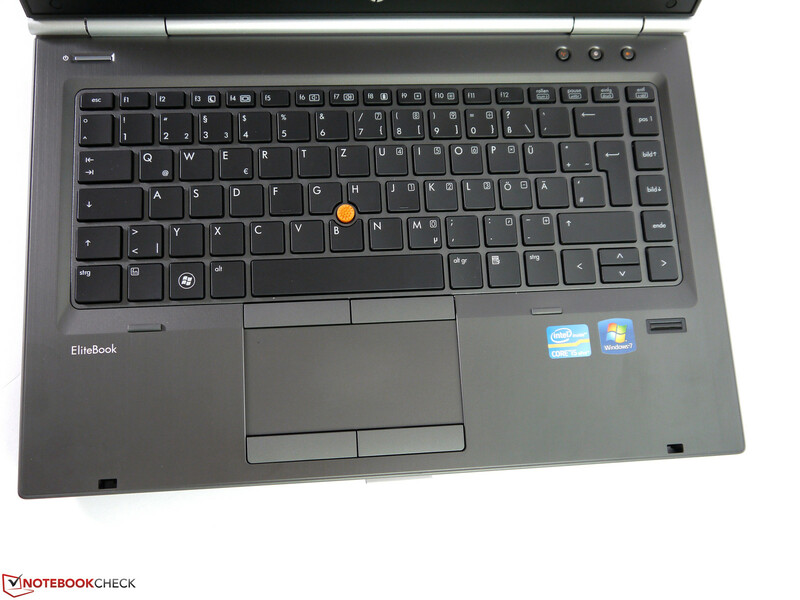 We extensively examined whether this is really a competitive, small-sized workhorse or whether we will only discover a hidden business laptop. 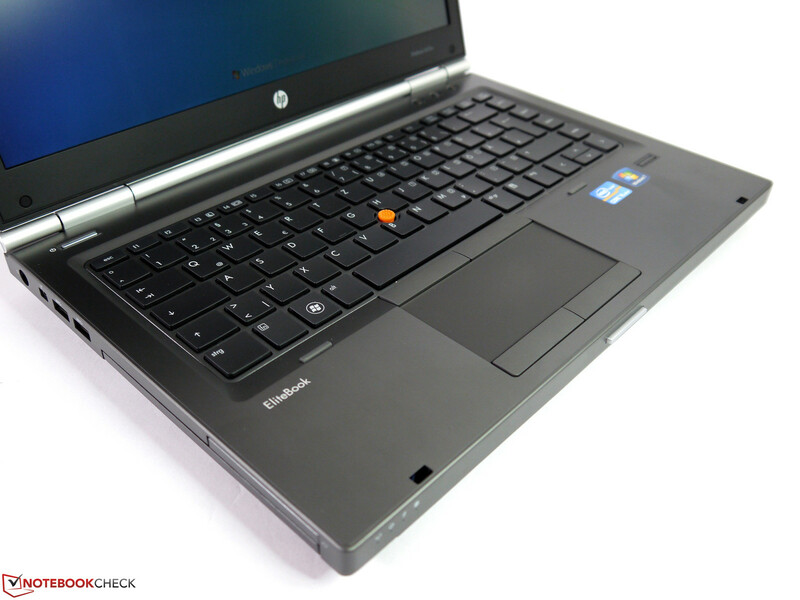 A few days ago, we had HP's EliteBook 8570w in our editorial office, which made a convincing impression for a typical representative of the 15-inch category. 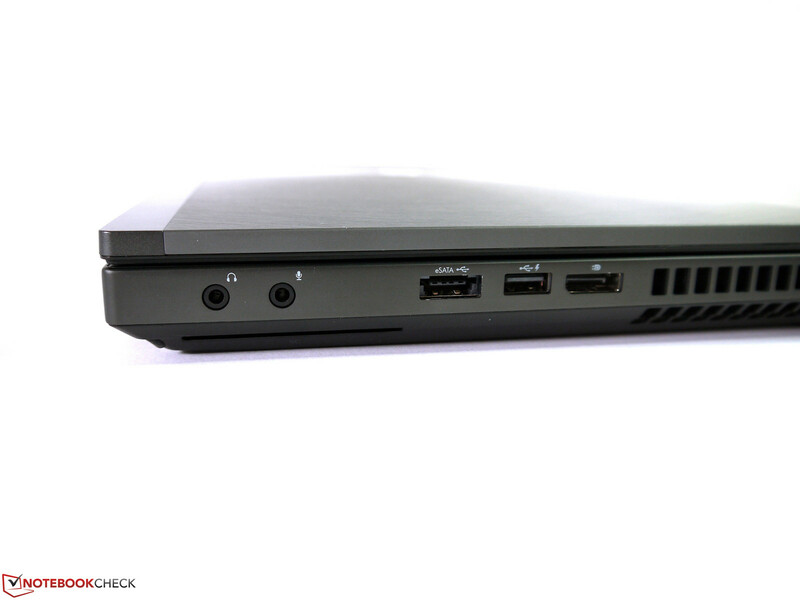 Particularly the mainstream workstation's casing quality and interface diversity set very high standards. So, it is no wonder that now great expectations are placed on the smaller 14-inch scion. Regardless of that, HP's EliteBook 8470w already occupies a special place anyway as there are no current contenders from Dell, Lenovo or Fujitsu in the 14-inch range. This makes us all the more curious to find out how the "mite" will fare in our demanding tests. We discovered four different configurations currently listed at retailers. All sport an HD+ screen (1600x900 pixels) and AMD's FirePro M2000 graphics card. Differences are basically found in the installed CPU (Intel Core i5-3360M or Intel Core i7-3610QM), the storage device and the RAM. Our test device is the currently lowest priced entry-level configuration for just under 1300 Euros (~$1661). 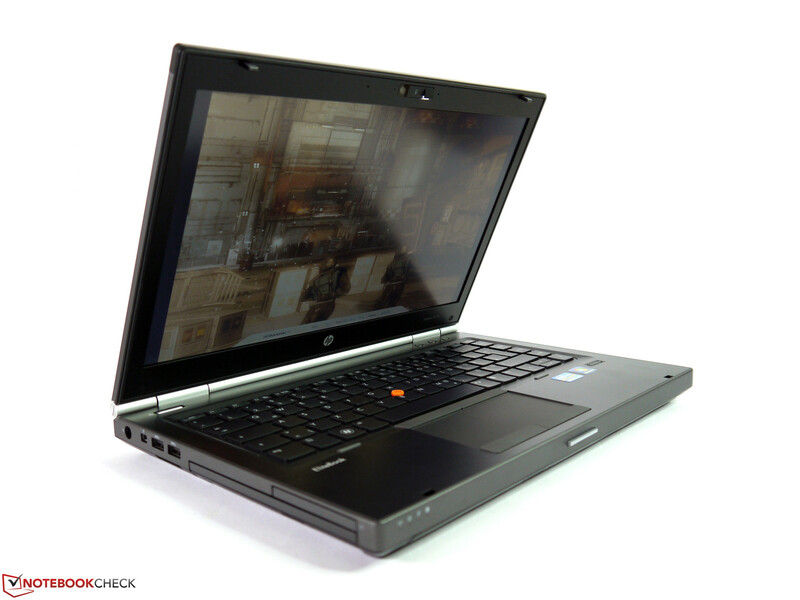 It includes a Core i5 CPU, 4 GB of RAM, the aforementioned screen and AMD graphics as well as a 500 GB hard drive. 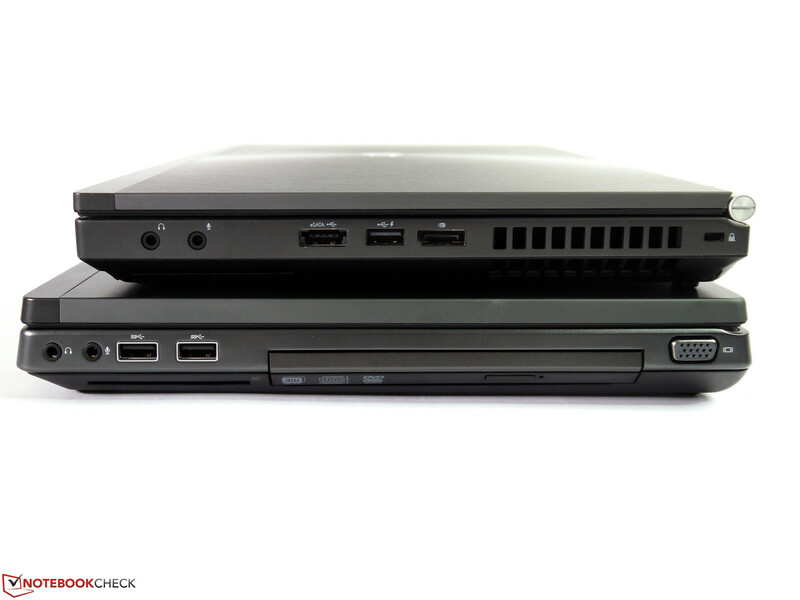 The only difference seen at first glance is the EliteBook 8570w's smaller casing. However, it also has outstanding casing qualities in a 14-inch format: a firm wrist rest, a stiff chassis, a top display hinge and a very resistant display lid. Even a longer examination did not reveal any weak points, manufacturing flaws or uneven gaps. The used materials make a very high-end impression and also delight the eye with its brushed aluminum looks. Thus, it should also be quite easy to clean. The good traits of the 15-inch model have been adopted on the base unit. 4 separate feet ensure stability when the battery is removed. The battery has a tight fit in its compartment when it is inserted and the base tray is not fixed by screws. The big advantage of this basically small casing is seen on the scales. 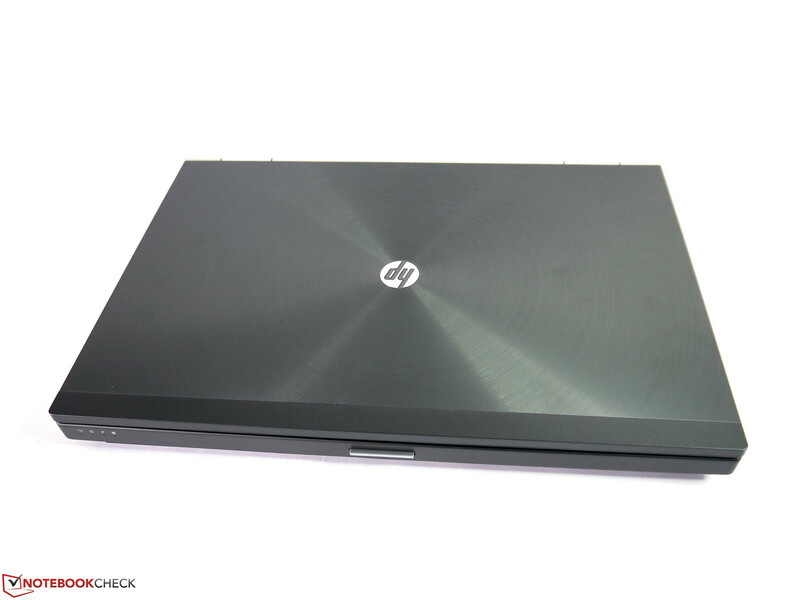 With 2.45 kg, it weighs exactly 800 grams less than HP's 8570w. HP's specified minimum weight of 2.25 kg could only be achieved with a solid state drive and a blank module in the modular bay. The casing's dimensions of 318 x 34 x 231 mm are also much smaller than that of the bigger brother. Consequently, a smaller and lighter 90 watt PSU is included, which contributes to the weight reduction by 520 grams. Totaling all reductions leads to a considerably higher portability, which has a positive impact on the possible scope of application. It can be said that although the casing has been slimmed down considerably, the positive qualities have been maintained. 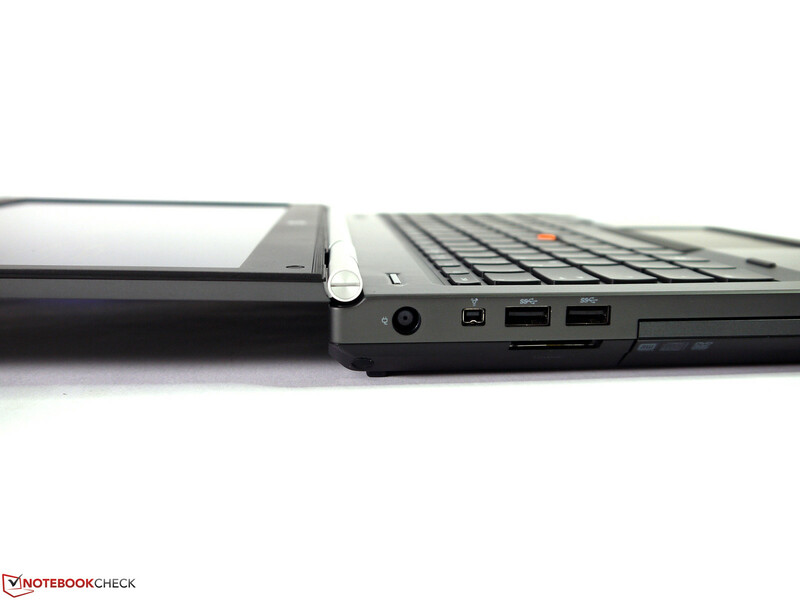 It presents a significant mobility advantage compared with the 15-inch model. Almost no compromises have to be made compared with the bigger workstations in terms of connectivity. USB 2.0, USB 3.0, eSATA, FireWire 400 (4-pin) and an ExpressCard slot should be more than sufficient for most requirements. 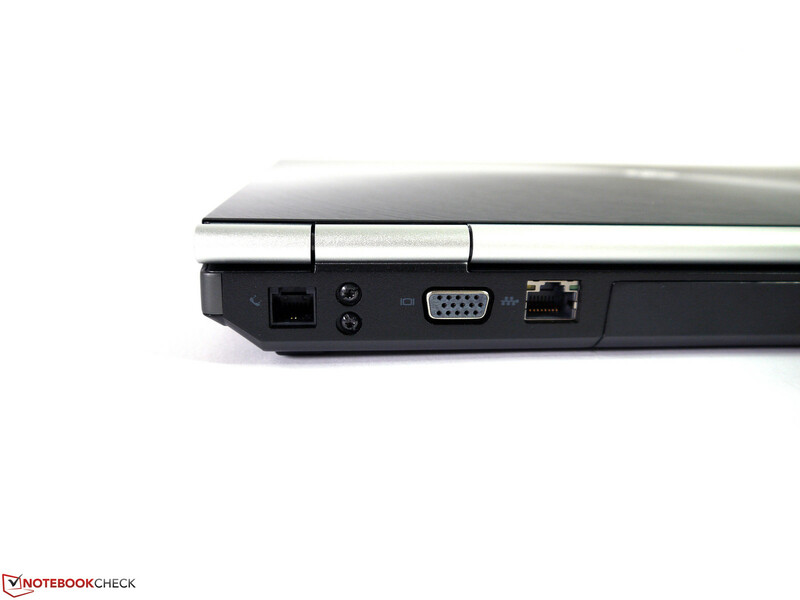 Beyond that, an analog VGA port as well as a digital DisplayPort can be used for connecting external monitors. 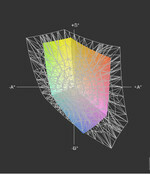 The VGA port rendered a focused and clear picture in a resolution of 1920x1080 pixels. The interface positioning has been solved much better despite the smaller sides and even presents a small added value compared with the bigger 8570w. In the far left back, we find FireWire, the card reader and USB 3.0, which should also be favorable for left-handed users when peripherals are connected. The modem port, Gigabit LAN and VGA are placed on the rear and are out of the way, although they are not quite as easy to reach. The interfaces on the right are within the mouse hand's crucial range. However, their easy access is pleasing and, with exception of the DisplayPort and eSATA socket, should only be needed when the other USB ports are occupied. One restriction that may be important to some users is seen inside the casing. The buyer has to opt for either a UMTS modem or an mSATA SSD. 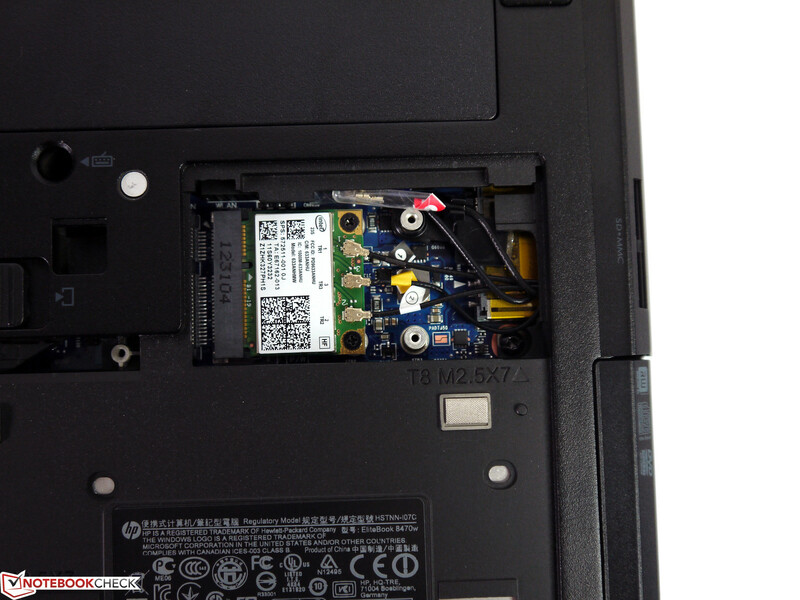 It is not possible to install both modules in the 14-inch laptop since only one slot is empty. 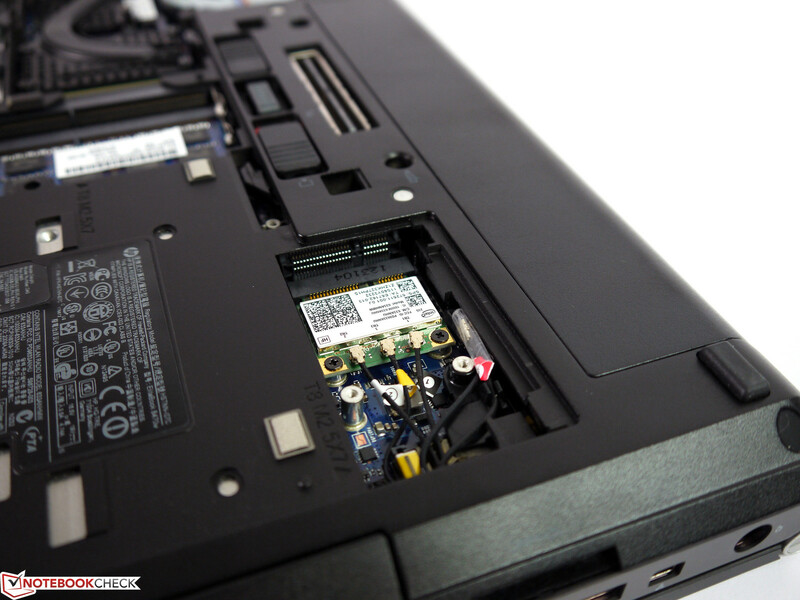 Intel's Centrino Advanced-N 6300 AGN Wi-Fi module is installed. It ensures stable transmission and good ranges. It can also use both the 2.4 GHz and the 5 GHz band. Gigabit LAN, Bluetooth 4.0 and a webcam (720p) also belong to the standards and an additional modem facilitates faxing documents, etc. The antennas for mobile internet access via a WWAN module (3G, UMTS, HSPA) are available and make a possible upgrade possible. 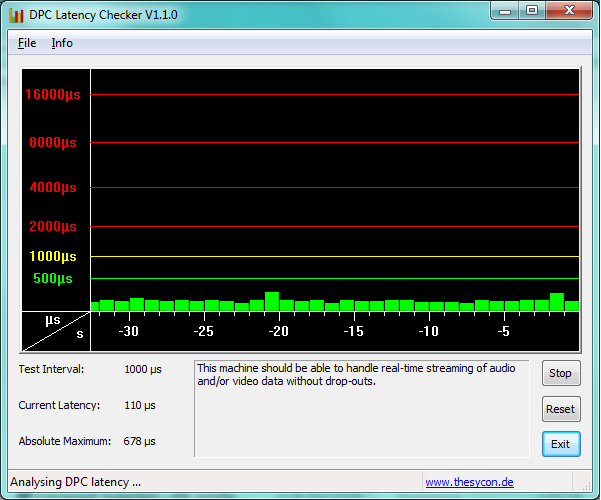 According to the data sheet, HP's hs2350 HSPA+ Mobile Broadband (QC431AA, approx. 130 Euros, ~$166) and HP's 2430 EV-DO/HSPA Mobile Broadband (QC430AA, approx. 110 Euros, ~$140) modules are compatible. Models that are pre-equipped with UMTS are currently not listed. Various HP software tools, such as hard drive encryption, face recognition and several password options, as well as hardware solutions like Trusted Platform 1.2, a fingerprint reader and SmartCard reader, cover common security features appropriately and are ready to use. The available options are extensive and offer many alternatives for protecting sensitive data from unwanted access. 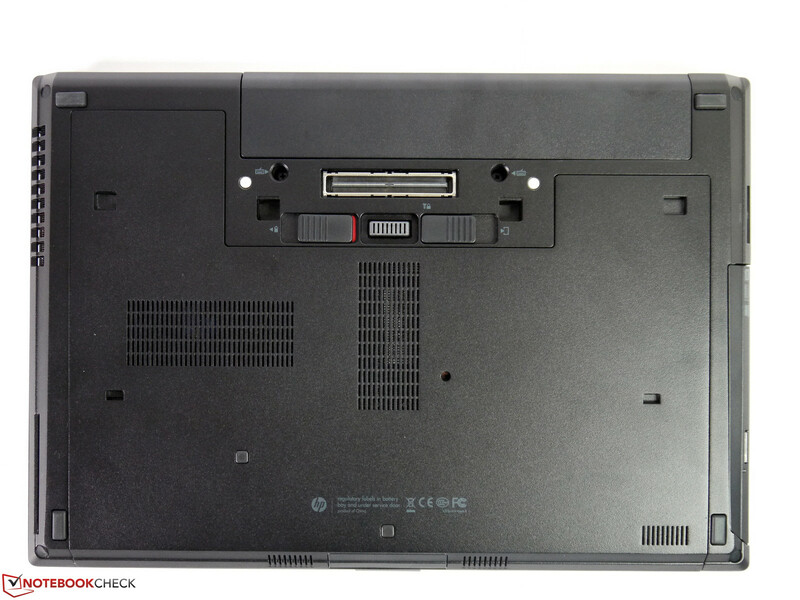 HP's EliteBook 8470w features a screw-less bottom tray that enables accessing the working memory, hard drive, Wi-Fi module, fan, a free mSATA slot and even the CPU and GPU after it has been removed. This construction is exemplary because it opens many possible modification options. Upgrading the working memory, replacing the hard drive with a solid state drive or inserting a UMTS module/mSATA SSD is very easy. The optical drive presents another upgrade possibility as it can be replaced with a blank module or a second hard drive / solid state drive. 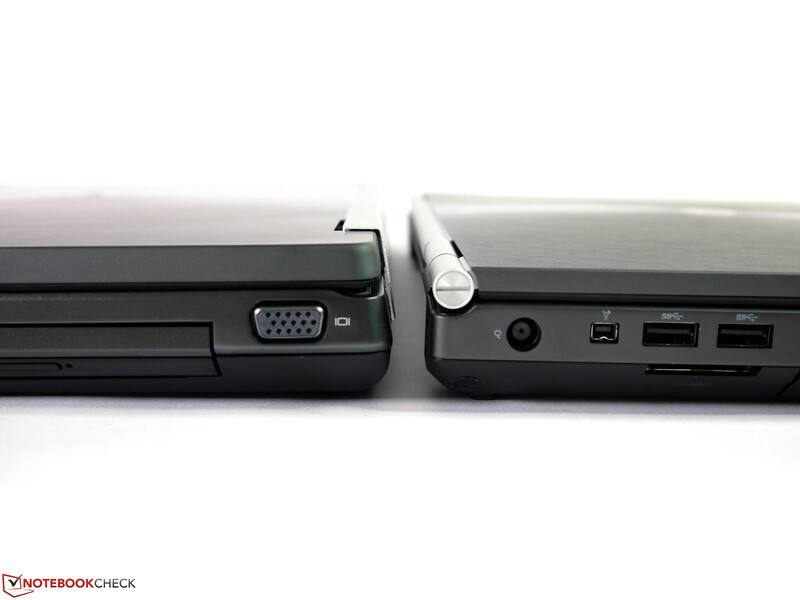 A built-in docking port also allows connecting several external peripherals quickly. 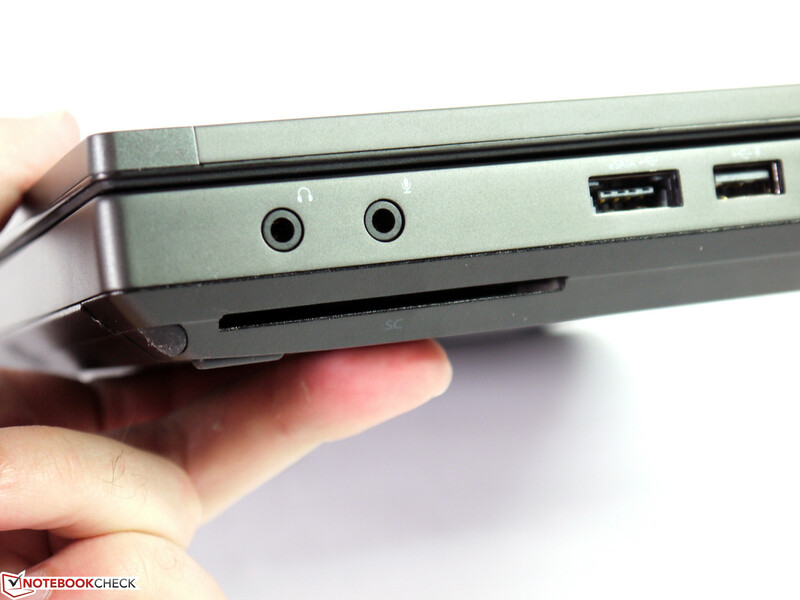 This, for example, is possible via HP's Advanced A7E38AA Docking Station (for approx. 200 Euros, ~$255). A 3 year warranty belongs to the musts of a workstation and can be extended via additional warranty upgrades and service contracts as usual. An interesting package for travelers would be an international on-site service for the next business day (U4418E, valid from date of laptop purchase, 3 years) for an additional 150 Euros (~$191). A dedicated number pad is not installed because of the casing's reduced width. This will particularly affect users who have to frequently enter long rows of numbers. However, this also has the advantage that the touchpad is almost centered on the wrist rest and reduces an awkward hand position or a slanted seating position. The keys in a 19 mm grid are otherwise agreeably big and convince with a medium-long key drop, accurate stroke and a very good typing feel. The somewhat metallic-like stroke noise is relatively quiet and does not get annoying even after a longer work flow. However, we deem the closely placed vertical arrow keys very worthy of improvement as they often cause typos. 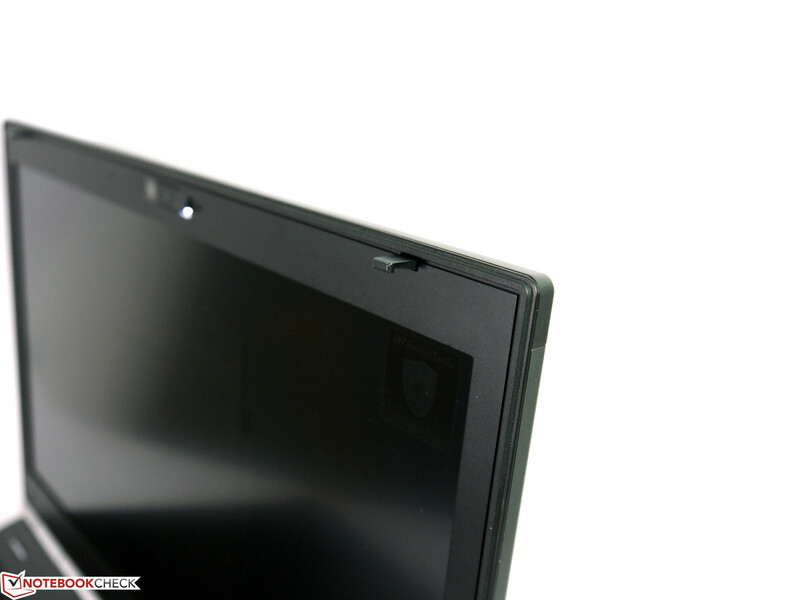 The lamp built into the display bezel, which is to replace the keyboard light, can be extended by the adjacent button. However, it only works when the image is outputted via the laptop screen. It also only illuminates roughly one third of the work field. This option cannot completely replace a real keyboard backlight and can only be considered a makeshift solution. The touchpad features a pleasant size, good gliding traits and is accurate in use. Common multi-finger gestures are supported and comprehensive settings can be made in Synaptics' drivers. 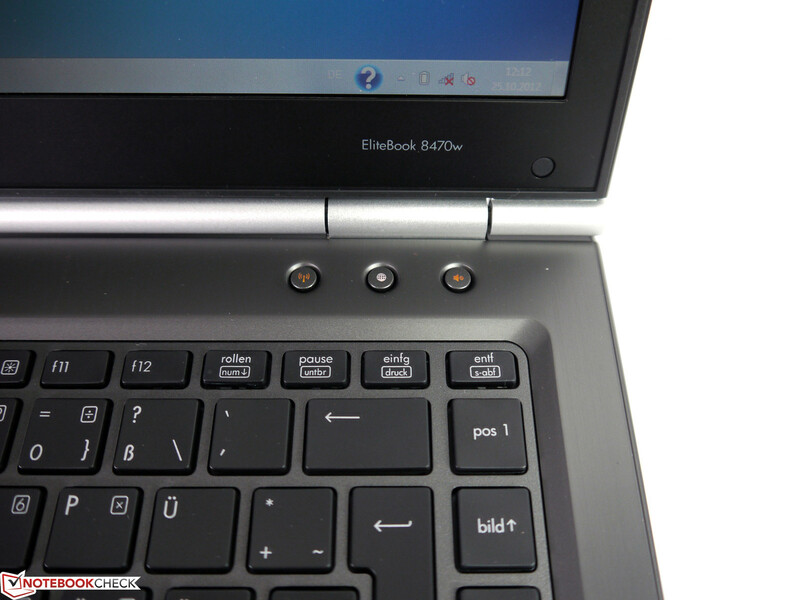 As in the EliteBook 8570p, we noticed that the responsiveness for finger taps lessens toward the edges in our test model. The click is first triggered when a bit more pressure is applied in these areas than in the center. 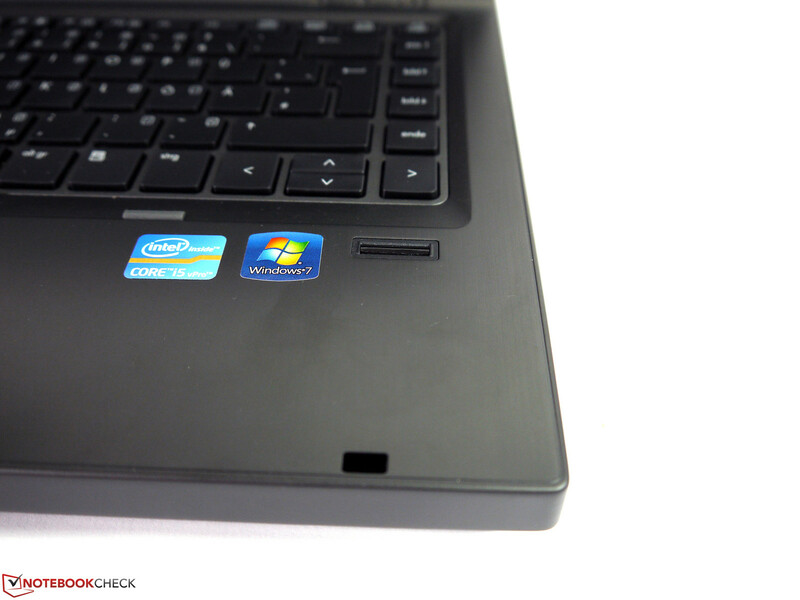 The touchpad keys are very well implemented and please with their lightly rubberized surface. We did not observe any problems here. 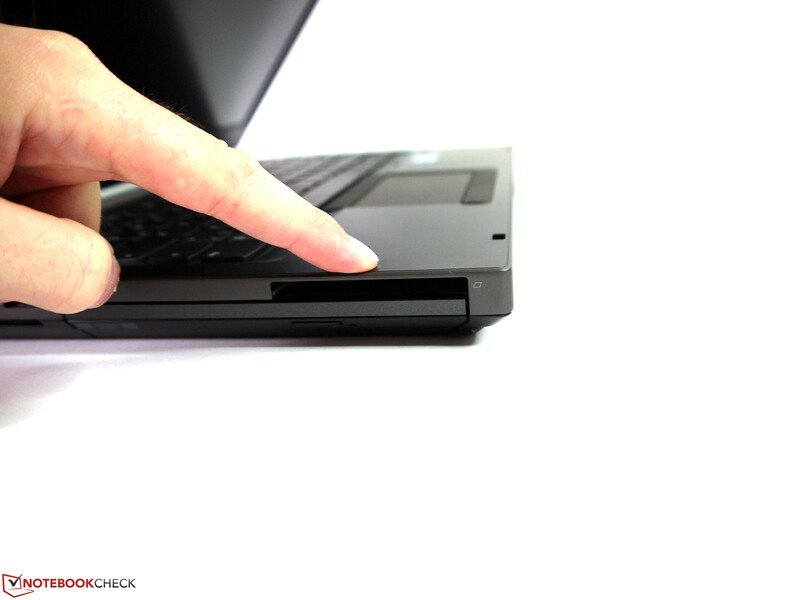 As usual for HP, the Pointstick provides a good alternative to the touchpad and can be moved very precisely by experienced users. 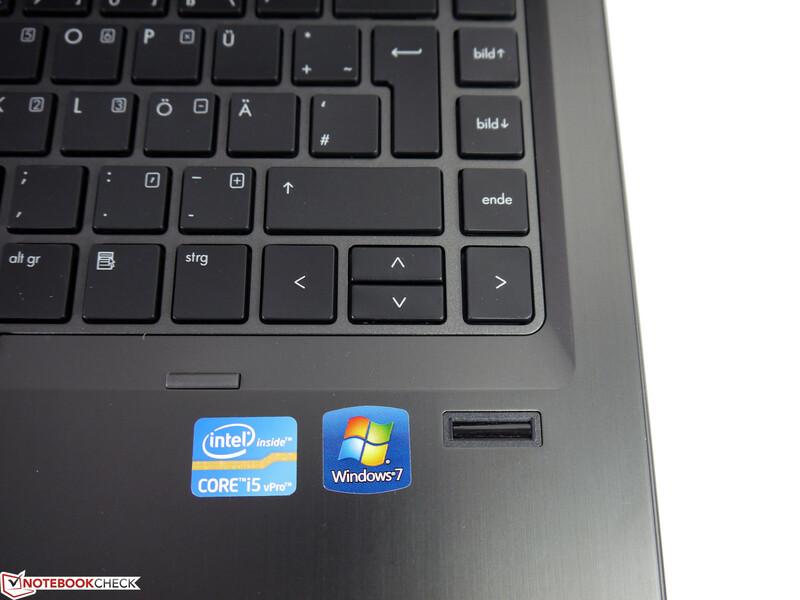 The equally flawless Pointstick buttons correspond to those of the touchpad and are implemented very solidly. HP's EliteBook 8470w is available with either a WXGA screen (1366x768 pixels) or a HD+ screen (1600x900 pixels) like in our test model. Both screens feature a matte surface and are illuminated by white LEDs. A fine grid that covers the entire surface of the LG screen is noticed directly after turning on the test model. This is seen so clearly that it gets very annoying after a while, especially when text is displayed. This trait is not as severe when looking at pictures or watching movies. In our opinion, the overall picture quality is affected to such an extent that many users might find it interfering. As usual, we measured the screen's maximum possible brightness at nine different points and recorded rates between 217 cd/m² in the lower right up to 288 cd/m² in the upper left. The screen's average brightness is 249.7 cd/m² at a moderate illumination of 77%. 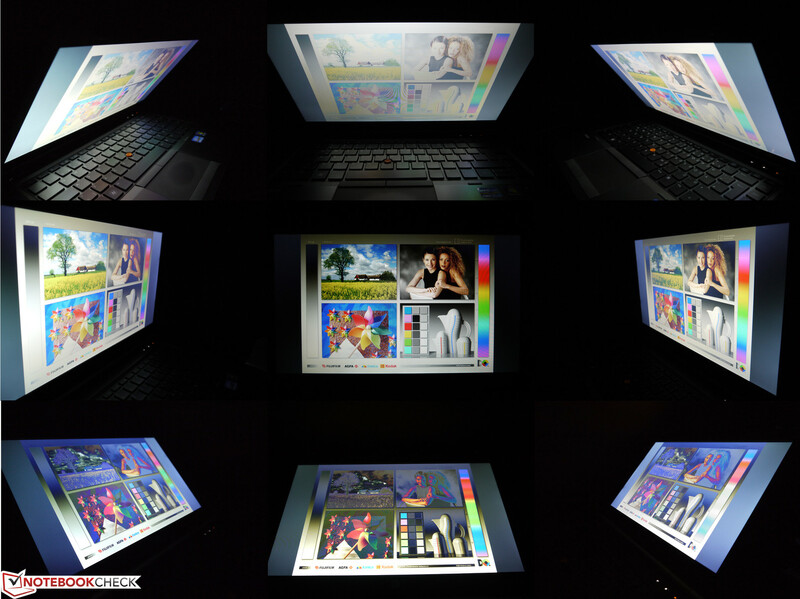 The overall brightness decrease from the upper left to the lower right is not only seen on monochrome contents, but also visible when looking closer at Office and multimedia applications. A usually sufficient ergonomic brightness of 148 cd/m² for indoor use is achieved when the screen is dimmed by 4 levels. The maximum brightness is available on battery for outdoor use; it is not limited. The measured contrast of 372:1 is not really a multimedia-suitable rate, although it excels over other mainstream screens by approximately 100%. However, this does not contribute to a visibly improved display of pictures, videos or games, which might result in a crisper and more vivid impression. The color spectrum coverage is also only standard fare as it can only reproduce approximately 60% of the sRGB color space. The viewing angle stability is on the customary TN level and inverting or fading is noticed at larger, vertical viewing angles, which can lead to illegibility depending on the screen's tilting angle. In return, the content is almost always readable horizontally and is only affected by minor color and brightness deviations. Seen in total, the screen is not suitable for professional picture or video editing due to the grid, the mediocre brightness distribution, the fairly low contrast and color spectrum coverage and the moderate viewing angle stability. Since the subjective impressions can vary strongly, particularly regarding the grid, the potential buyer should first take a look at the screen before buying if possible. According to HP's homepage, the EliteBook 8470w can be configured with Intel's Core i5-3360M CPU up to Intel's Core i7-3740QM CPU. However, the models currently listed in some countries only sport Intel's Core i5-3360M like in the test device, or Intel's Core i7-3610QM. 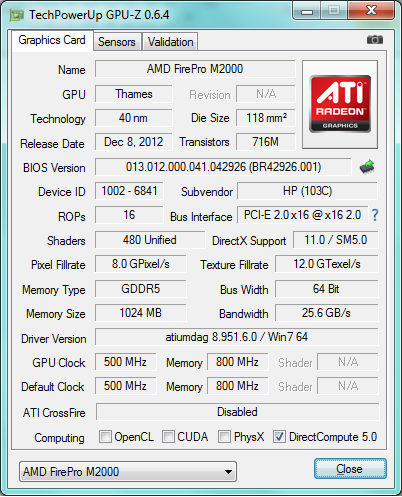 All have AMD's FirePro M2000 graphics card with a 1 GB GDDR5 video memory in common and there are no alternatives. 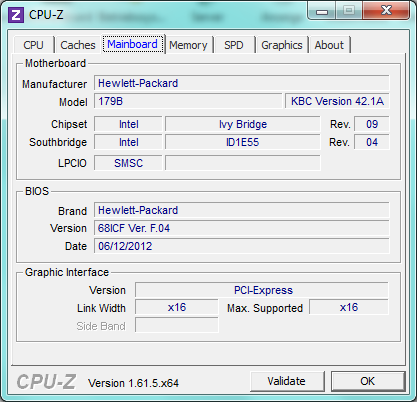 The integrated Intel HD Graphics 4000 is not active. 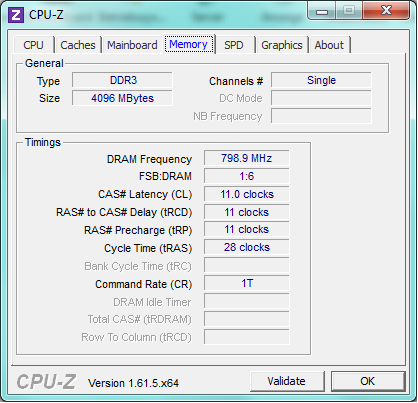 The RAM configuration ranges from 4 to 8 GB. However, the maximum is 16 GB (also quad-cores). In addition to conventional 500 and 750 GB hard drives, a configuration option with a 160 GB solid state drive is also listed. The street prices range from approximately 1300 Euros to 1900 Euros (~$1661 to $2427). 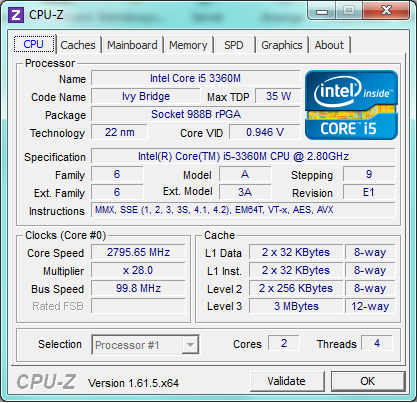 Intel's Core i5-3360M CPU with a clock rate of up to 3.5 GHz and Hyper Threading can be classified as an entry-level processor in the workstation range. It can only keep up with quad-core processors in single-thread applications. The dual-core CPU clearly lags behind when the respective application can use all processing cores. However, this does not at all mean that it is a slow processor. The performance is easily sufficient for many tasks and they are processed at an appropriate pace. The entry-level CPU can even slightly surpass Intel's Core i7-3610QM in the usual single-thread tests, such as SuperPi 32M calculation (605s) or Cinebench R10 64 bit single benchmark (5867 points). MP3 converting via iTunes reaches a 49.8-fold speed and benefits from the high maximum clock rate (see graph). 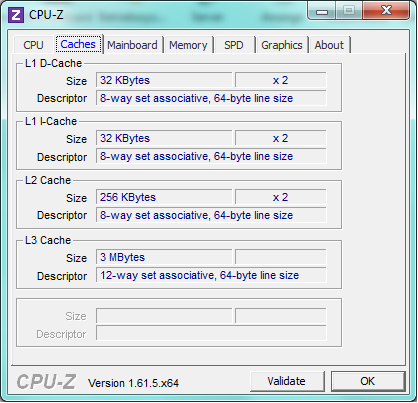 However, the test CPU finds its limits in multi-thread tests as can be seen in the score of 12321 points in Cinebench R10 (64 bit multi) or 467s in the wPrime 1024m calculation. This confirms the limited performance in conjunction with multi-core optimized software. A moderate performance throttling of roughly 20% was observed on battery power, as was the case in HP's bigger EliteBook 8570w. For example, only 4898 points in single and 10498 points in multi were achieved in Cinebench R10 64 bit. We could not provoke PSU or temperature-related throttling even after an hour of load using Furmark and Prime95. It can be confidently assumed that the overall performance of a workstation suffices for routine tasks, such as Office, internet and picture editing. 8223 points in PCMark Vantage and 2285 points in PCMark 7 are good scores that confirm decent business suitability. 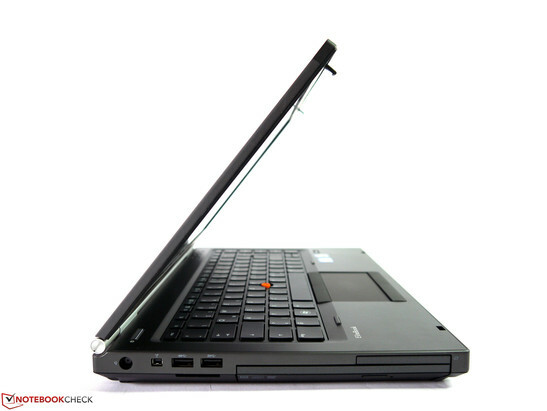 Even conversion tasks are performed quickly and are not a big problem for the laptop. In contrast to converting via the CPU with a load of 90%, we recorded a much lower CPU load of 4 - 60% and processing was considerably faster when the respective software supported GPU usage, depending on the task. However, performance limitations can be found in the area of working memory and hard drive. Since only one RAM module is installed, it works in single channel mode and slows down the work speed a bit. For example, an additional PCMark Vantage test using 2x 2 GB of RAM rather than 1x 4 GB of RAM finishes with a score of 9028 points instead of 8223 points. 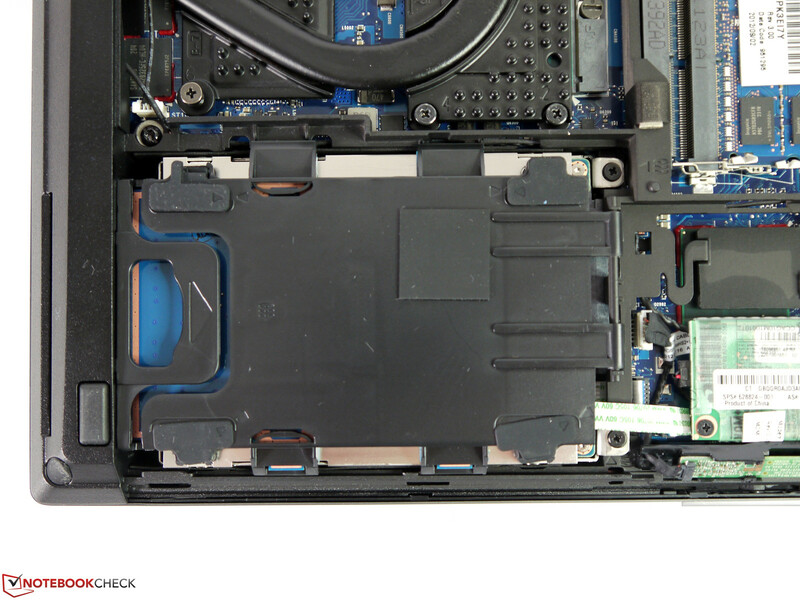 An even bigger performance increase can be achieved by replacing the hard drive with a solid state drive. This would especially increase the response characteristics and the subjective system speed. 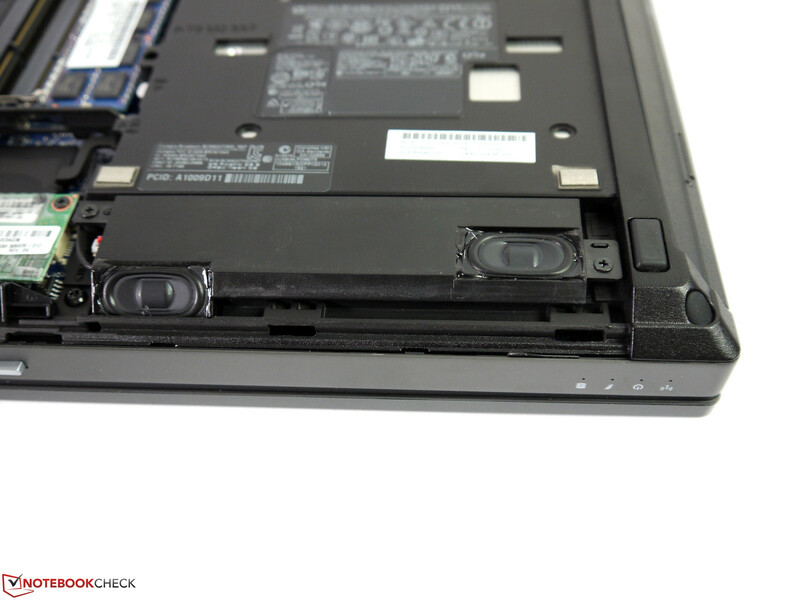 HP's EliteBook 8470w uses the same 500 GB hard drive from Hitachi as found in HP's 8570w. With a rotation speed of up to 7200 rpm, this model achieves somewhat higher transfer rates than slower rotating models, but it does not lead to a subjectively faster work speed. Also, faster spinning models include a higher operating noise, which makes silent laptop use virtually impossible. Replacing the conventional storage device with a solid state drive would remedy both cases. The disadvantage of this solution is still the much poorer euro-per-gigabyte ratio, which either leads to a considerably lower memory capacity or a significantly higher purchase price. 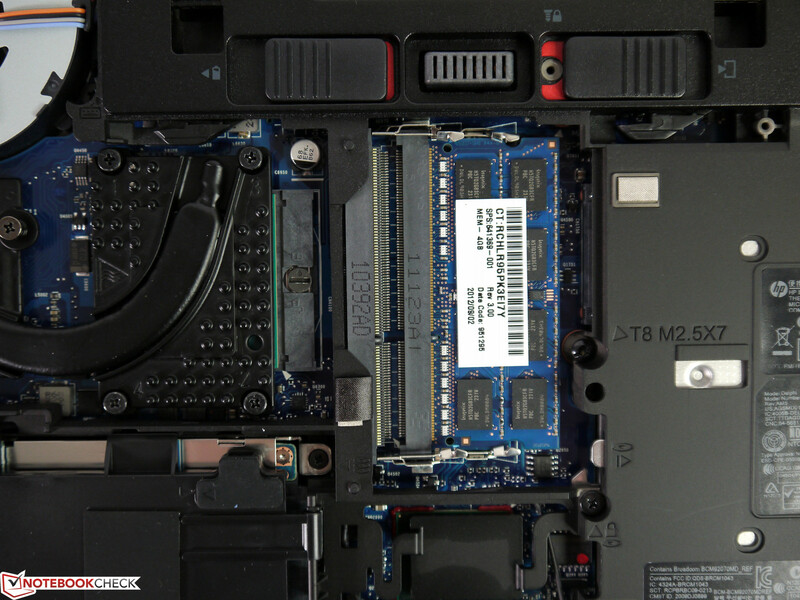 Otherwise, the storage device can also be complemented by an mSATA SSD or an additional drive in the modular bay (in exchange for the optical drive) in this 14-inch workstation. The mSATA speed is also limited to SATA II standard in this test model and "only" lets our Crucial M4 mSATA SSD reach just below 270 MB/s in read (approx. 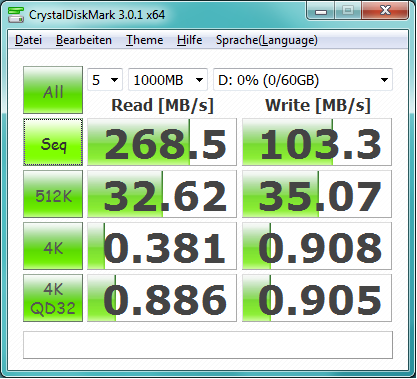 500 MB/s is possible with SATA III). AMD's professional FirePro M2000 mainly differs from the standard consumer graphics chips by a special BIOS and drivers optimized for professional applications. The other technical specifications, i.e. 480 shader units, 500 MHz core clock, 800 MHz memory clock (1 GB GDDR5) and above all a narrow 64bit memory bus, are entry level. The results of 6086 points in 3DMark 06, 3956 points in 3DMark Vantage and 954 points in 3DMark 11 (the standard benchmarks that do no benefit from the professional driver optimization) clearly lag behind Nvidia's Quadro K1000M or Nvidia's GT 630 and are only on the level of AMD's Radeon HD 7570M. This looks completely different in the OpenGL performance. With a score of 8571 points in Cinebench R10 32 bit and 28.88 points in Cinebench R11 OpenGL Shading, it partly outperforms models featuring much better equipment, such as AMD's Radeon HD 6990M (8394 points CB R10 32 bit) or direct contenders like Nvidia's Quadro K1000M (26.3 points CB R11). 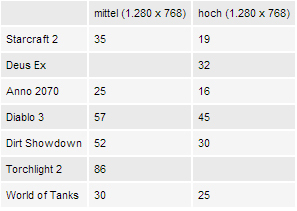 Our graphics card benchmark chart also provides extensive comparisons. AMD's FirePro M2000 even outdoes the Quadro K1000M or still easily keeps up with the Quadro K2000M in some areas of professional CAD applications and where it has to demonstrate its abilities. Particularly Lightwave, Maya and Solid Works users might find a solution with a much better value for money ratio in the bigger EliteBooks featuring AMD's FirePro M2000. The performance differences could be as much as over 210% (Quadro K2000M) or 114% (Quadro K1000M) in favor of the FirePro in other programs, such as Pro Engineer. 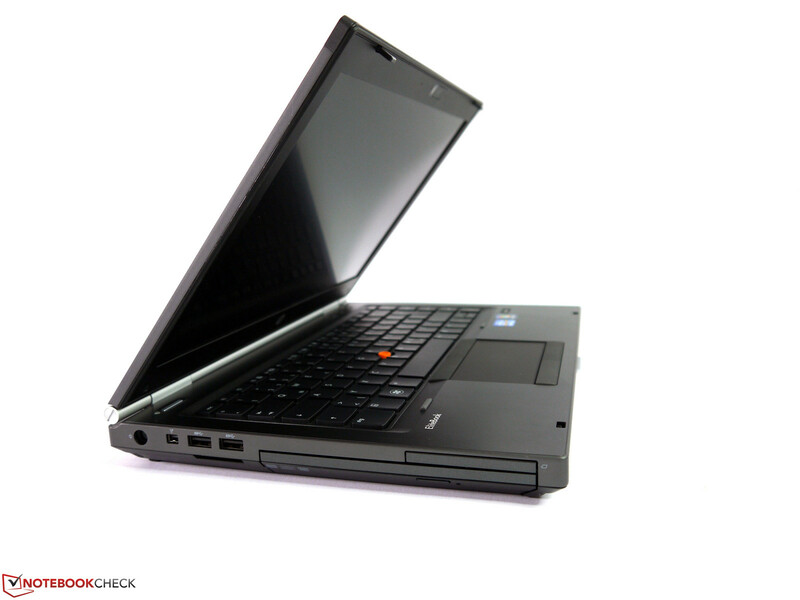 Potential buyers should carefully consider for which tasks the laptop is required and then choose it accordingly. We noticed that it is not possible to select the common HD resolution of 1366x768 on HP's 8470w's screen or on an external monitor in the gaming tests. This means there are big gaps in our benchmark chart regarding medium settings which usually cover exactly this resolution. Alternatively, we performed tests using a resolution of 1280x768 pixels and otherwise same settings. However, we did not add these to our database for comparison reasons. The results can be found in the additional chart. Overall, the ascertained gaming performance of AMD's professional FirePro M2000 is roughly on a par with a GeForce GT 630M. Many games can be rendered smoothly in low and medium settings, single games like Torchlight or Diablo III also still look good in high settings. The fairly poor performance in World of Warcraft surprised us a bit. It was almost two-thirds lower than with Nvidia's GeForce GT 630M. We see a possible explanation for this in an insufficient driver support. The operating noise can be reduced to the hard drive's noise level of 32.4 dB(A) when "Fan always on" is disabled in the BIOS options. The fan otherwise runs permanently with 34.7 dB(A) and is always very audible. 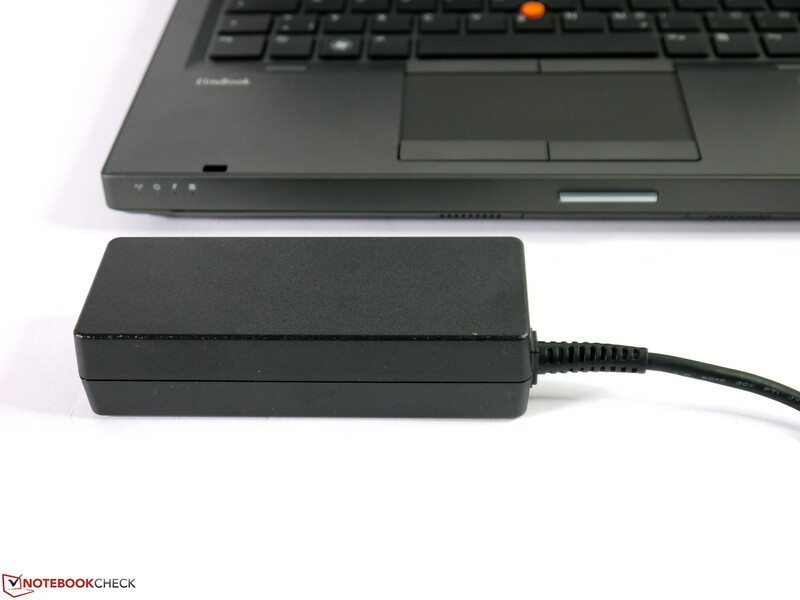 A virtually silent laptop during low load in Office mode could be accomplished by using a solid state drive or a quieter hard drive. The noise level increases to 37.8 dB(A) in medium and 44.2 dB(A) in full load. 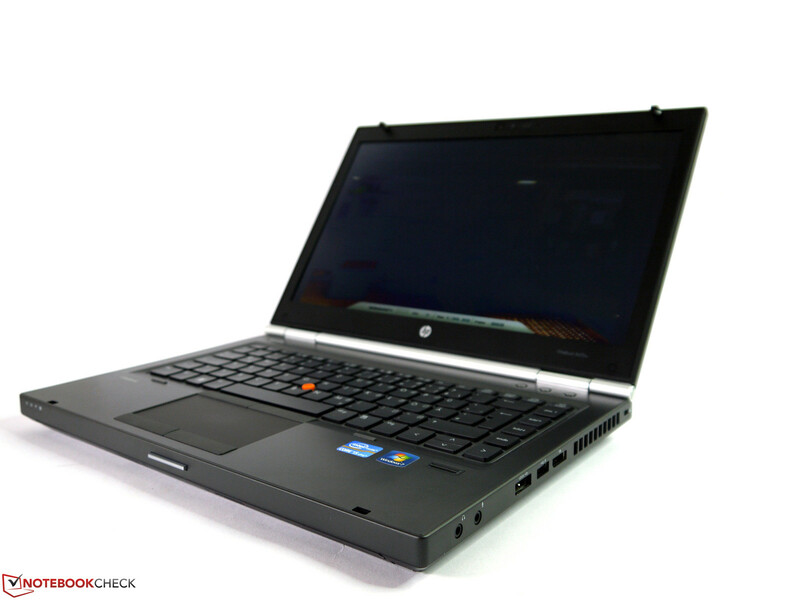 Thus, the smaller 14-inch laptop is a bit quieter than HP's EliteBook 8570w. However, the optical drive's noise of 40.2 dB(A) makes watching videos impossible because it is very prominent when playing a movie. We did not observe a high-pitched or sporadically pulsating noise behavior in the test model. The fan's consistent behavior lets the casing's surfaces stay very cool even during full load. 37.5°C at the air outlet is not a sign for any possible constraints. (+) The average temperature for the upper side under maximal load is 26.1 °C / 79 F, compared to the average of 31.1 °C / 88 F for the devices in the class Workstation. (+) The maximum temperature on the upper side is 31.4 °C / 89 F, compared to the average of 37.1 °C / 99 F, ranging from 23 to 69.8 °C for the class Workstation. (±) The average temperature of the palmrest area of similar devices was 27.8 °C / 82 F (+0.1 °C / 0.1 F). The sound output via the two small speakers on the front is quite useful even for smaller presentations or movies in a small group. The slightly treble-heavy sound quality features a bit of mid-ranges and audible bass and can be rendered with a good and clear maximum volume when it is carefully adjusted. Our test device's power consumption ranges from 12.7 watts up to 70.3 watts in full load via Furmark and Prime95. The PSU provides a nominal power of 90 watts and consequently has enough reserves. 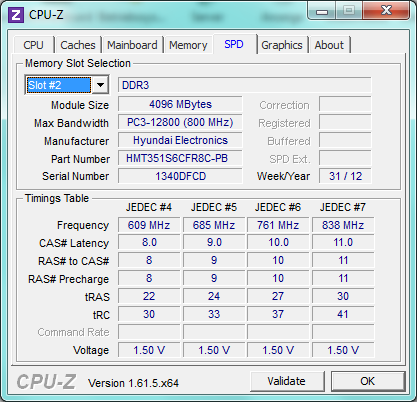 The low-load power consumption could be reduced even further if the actually existing, though not enabled, Intel HD Graphics 4000 were activated. 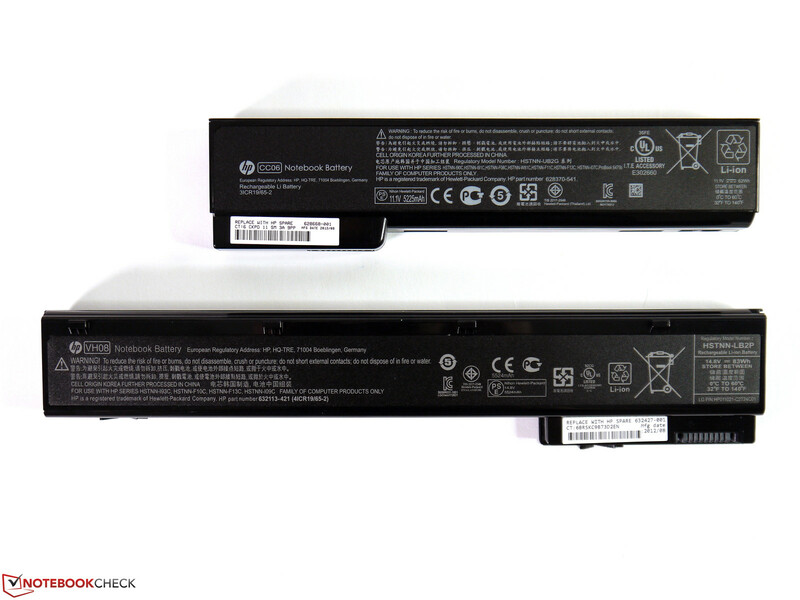 The 63 Wh battery can be complemented with higher-capacity alternatives or additional batteries. 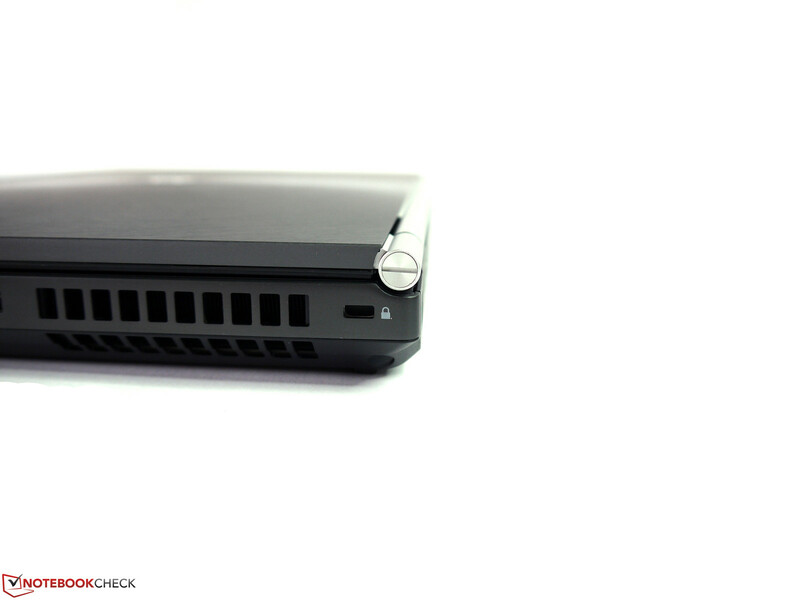 For example, a 100 watt slice battery, Ultra Extended Life (QK640AA), is available for approx. 100 Euros (~$127) and should at least double the runtime. The 63 Wh was enough for a runtime of 5 hours in BatteryEater's Reader's test (using minimum screen brightness, energy-savings mode and all other consumers off). Roughly 4 hours of Wi-Fi surfing was possible with a brightness of nearly 150 cd/m², Wi-Fi on and energy savings mode. A movie played using the DVD drive can last up to 3.5 hours in maximum brightness, Wi-Fi off and energy-savings mode. The reduced maximum performance has a positive effect on the battery runtime in BatteryEater's Classic test using maximum brightness, all on and the high-performance profile. It still enables one hour and ten minutes without AC power. 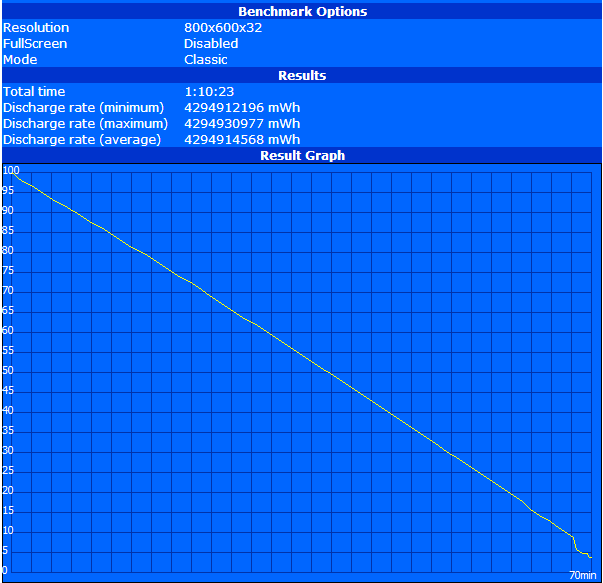 The calculated average power consumption is approximately 55 watts rather than the possible 70 watts in AC mode. HP's EliteBook 8470w is a very good implementation of cutting-edge laptop technology alongside fundamental workstation qualities. Particularly the connectivity, upgrade options and casing quality are exemplary. Nevertheless, we cannot recommend it without reservations because just the most important user interface, the screen, exhibits an unnecessary restriction. The entire screen is covered with an obtrusive grid that is annoying in the long run and represents a downright nuisance. If you can live with that, you will get a portable, powerful and very high-end work device that can compete with the larger workstations which feature similar equipment. However, you should always keep the expected software to be used in mind when buying because significant positive and negative differences in the 3D graphics performance may evolve compared with the competition from Nvidia. Potential is also wasted in the small 14-inch laptop because Intel's HD Graphics 4000 is not enabled. Battery life, noise emissions and functionality could noticeably benefit from an enabled CPU graphics. 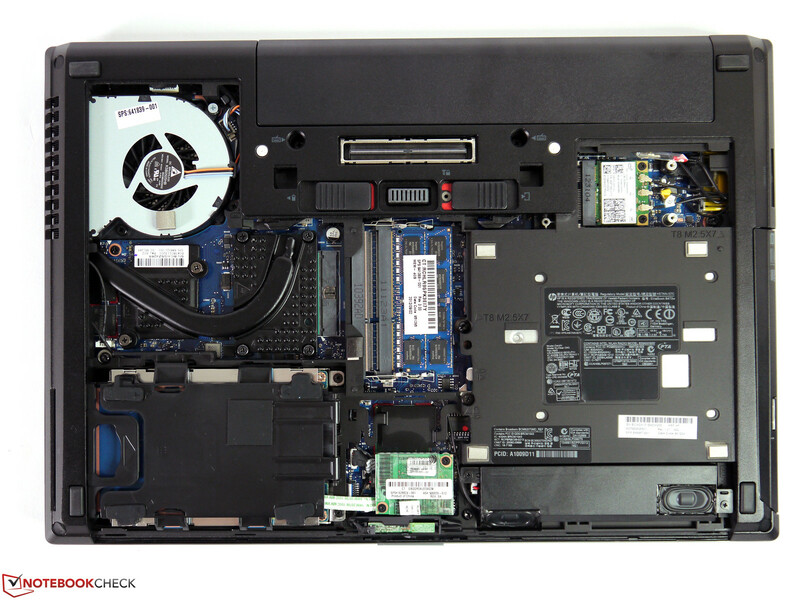 The 8470w expands HP's workstation range with a 14-incher. The screen can be tilted far to the back. The fairly compact PSU provides enough power. 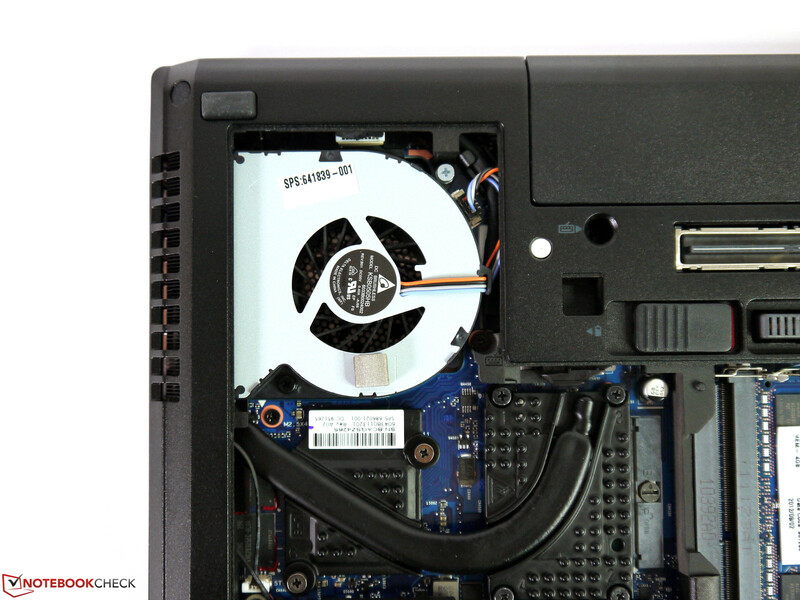 The stiff, protruding PSU connector is typical for HP. The base tray is not fastened by screws. 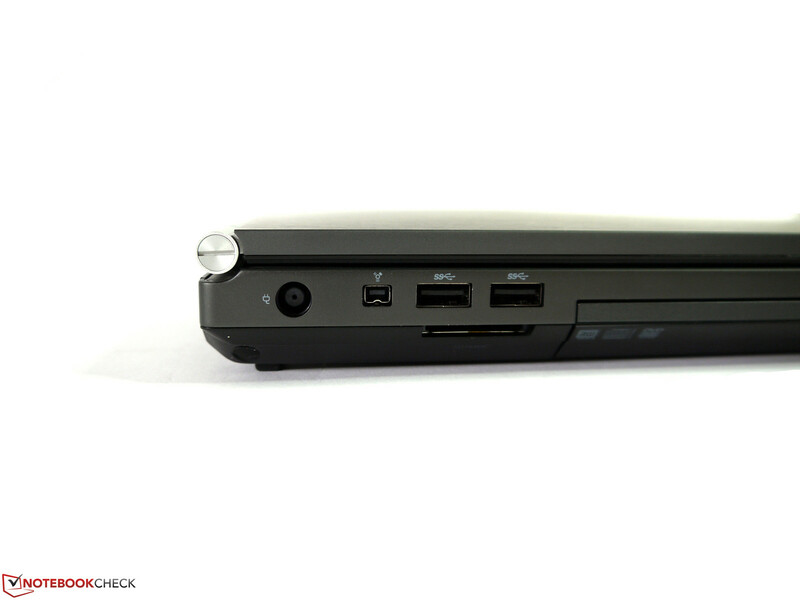 A docking port is also available and can be connected to HP's docking stations. All important components are found underneath the cover. The fan is easy to access. The memory capacity should be doubled quickly. 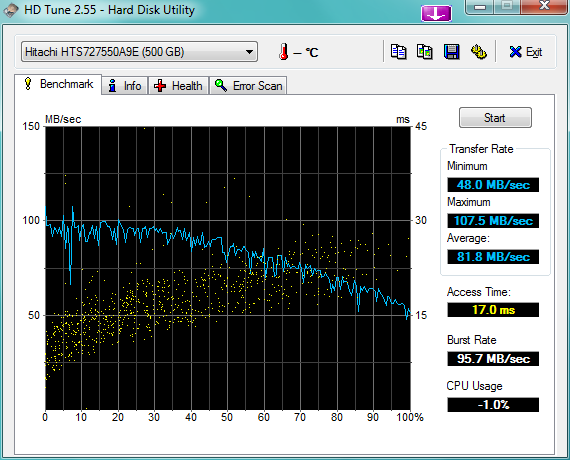 The loud hard drive does not have many favorable qualities. A Wi-Fi module is installed. There is room for a UMTS modem (antennas available) or an mSATA SSD above it. The speakers provide a quite good sound output. 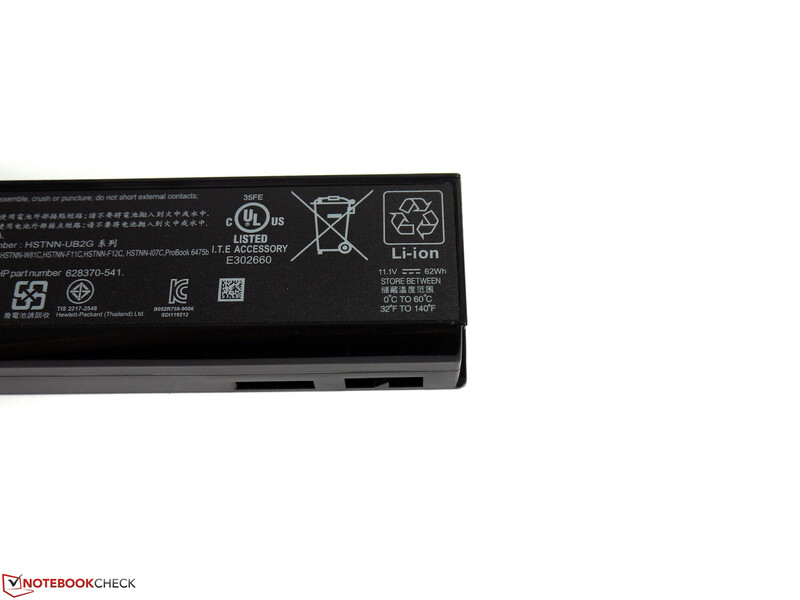 The 63 Wh battery features an average capacity, which can also be expanded optionally. The batteries of the 14- and 15-inch models are not compatible. Only SATA II speeds are achieved with an mSATA SSD. The keyboard light cannot really be taken seriously and is not very useful. The screen is kept closed by a ramshorn hook as usual. The wrist rest is extremely solid. The excellent casing quality and the interface diversity are also implemented in an exemplary way in the smaller model. Compromises have to be made in the maximum performance and thus component options. 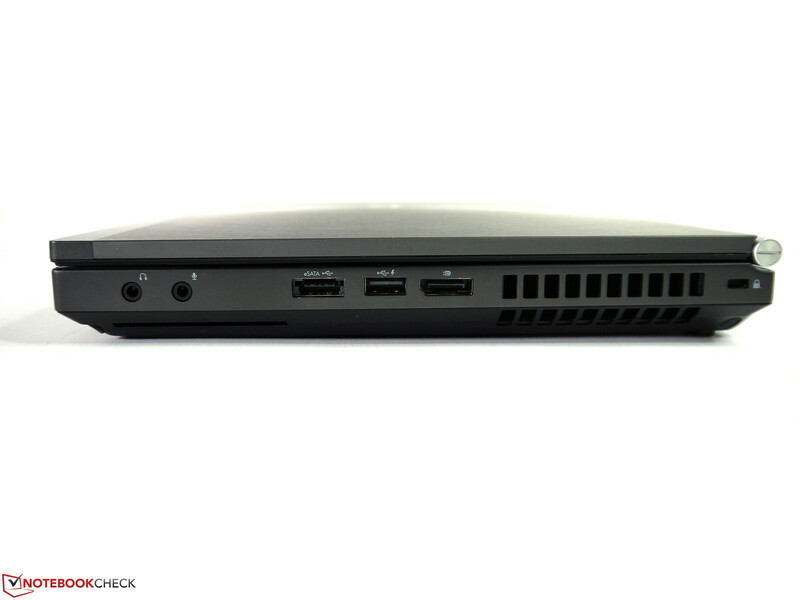 The interface positioning is solved even better than in HP's bigger 8570w. 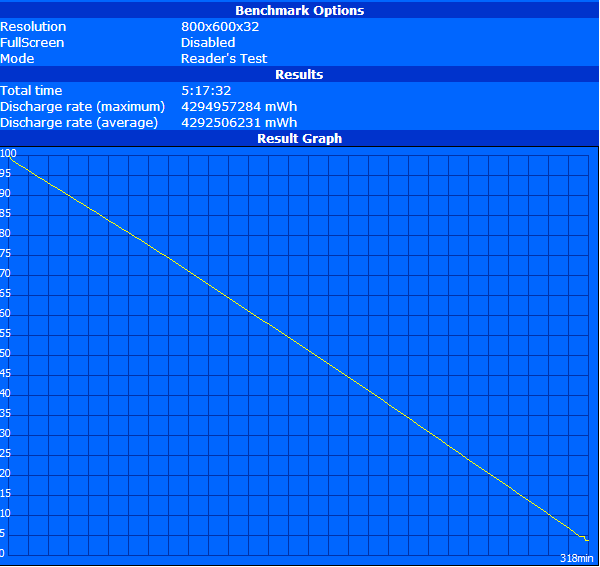 The screen disappoints with mostly only standard rates alongside an interfering grid. Merely the resolution of 1600x900 pixels and the high maximum brightness are positive features. The 14-incher scores in mobility. The casing's smaller dimensions and lower weight provide for a much higher portability. The high-quality build has been maintained and is a decisive positive aspect. 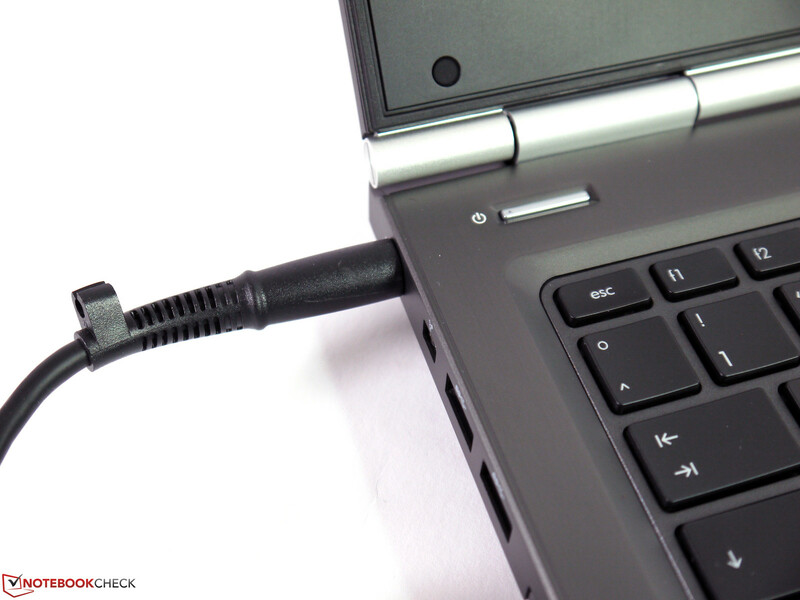 Besides up-to-date interfaces, such as USB 3.0, you will also find eSATA and FireWire. Should the connectivity options not be sufficient, an ExpressCard expansion will certainly help. 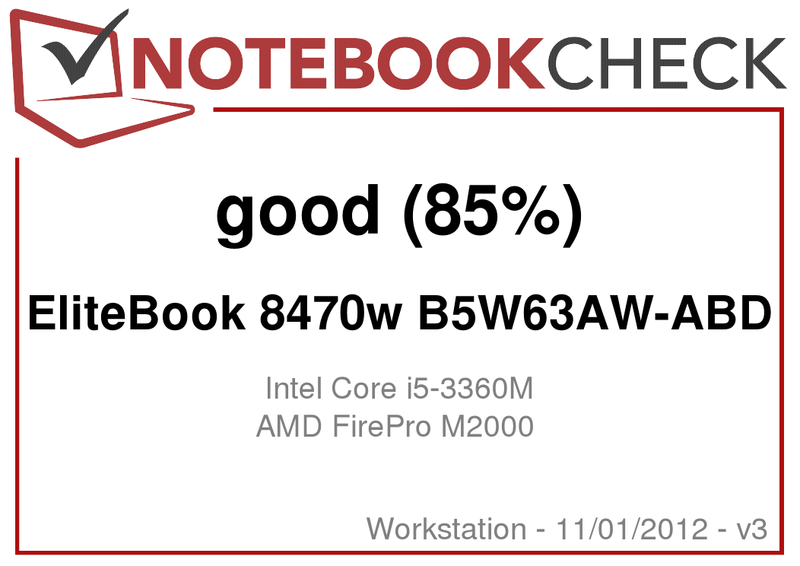 The EliteBook does not show any weaknesses even in this often critical area. The rear-sided interfaces are the least interfering. The cooling design still has enough reserves for stronger CPUs. 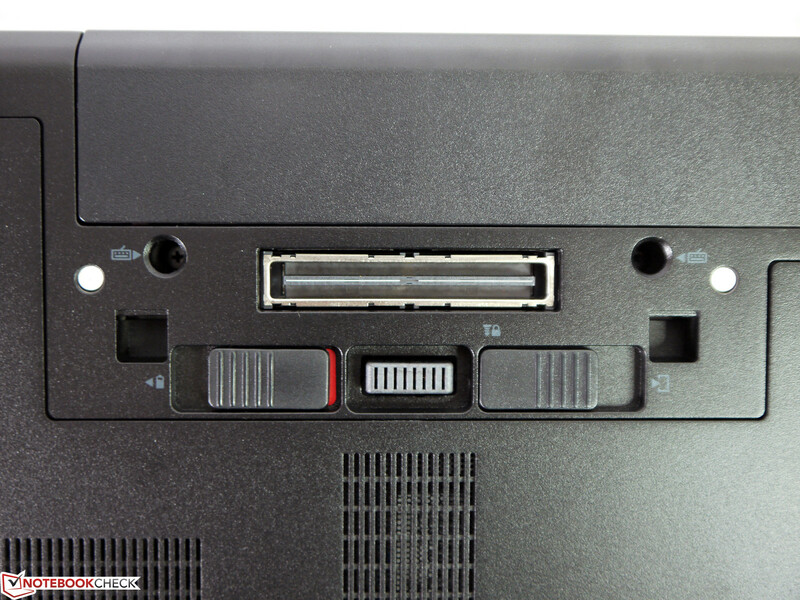 The audio ports are separated from each other. The SmartCard reader is a bit more difficult to access. 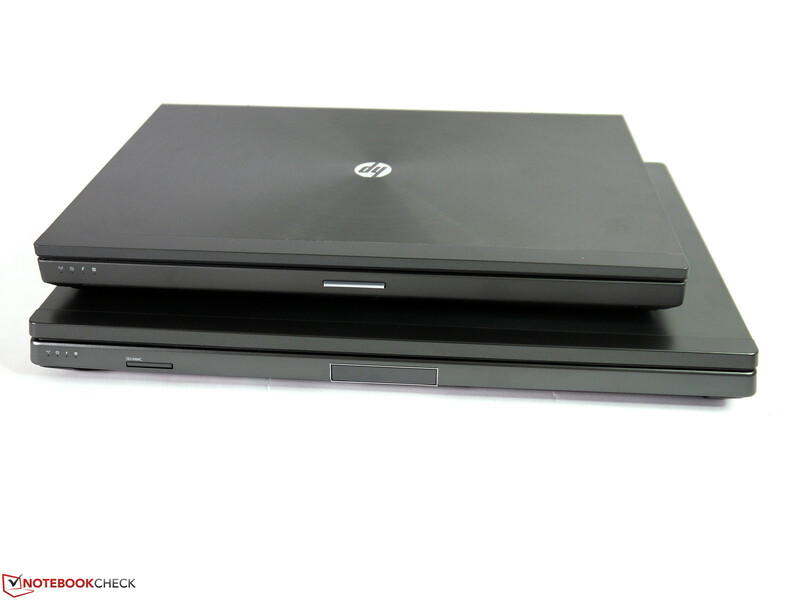 That HP has managed to fit typical workstation virtues into a relatively compact 14-inch casing and has made a big step in mobility in this device category. A higher-quality screen without a grid and that also comes with good contrast, good illumination as well as an appropriate color spectrum for the professional field. 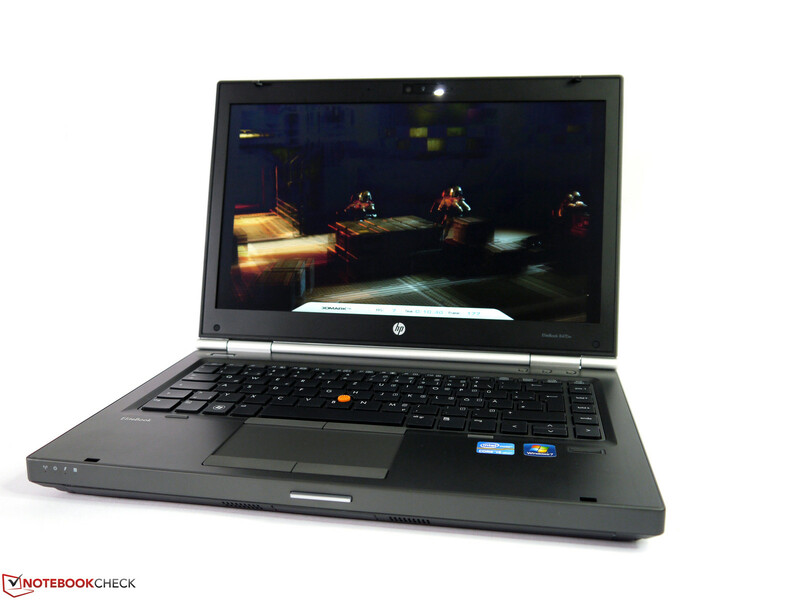 That HP does not exploit the advantages that an additionally enabled Intel HD graphics offer in this model either. Does not exist in the 14-inch category. 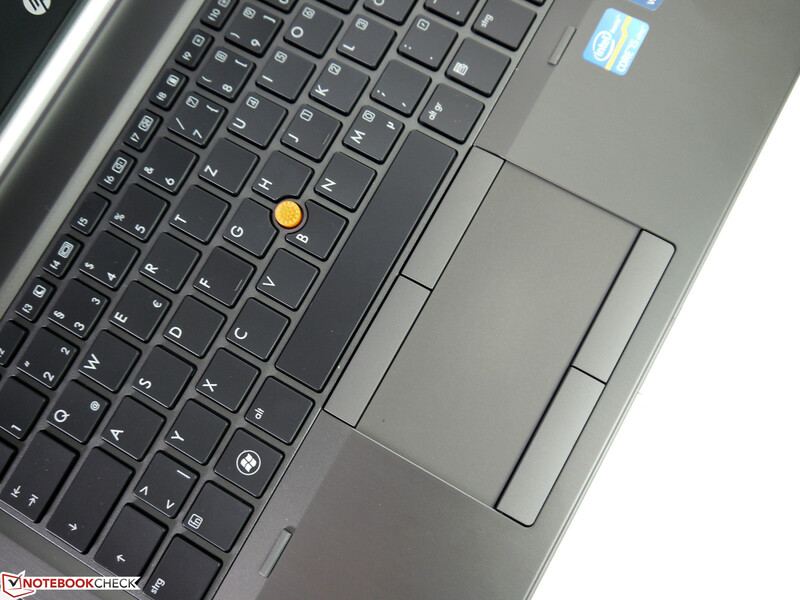 Nevertheless, HP's 8470w has to compete with the established 15-inch category, which has many advantages to offer regarding screen and performance: HP EliteBook 8570w, Fujitsu Celsius H720, Dell Precision M4700 and Lenovo ThinkPad W530.